In its January 2011 review and forecast of the laser industry, Laser Focus World projected worldwide commercial laser revenues of $7.05 billion, of which about $3.3 billion are laser diodes. The article goes on to provide an extensive discussion into where and how these lasers are used. By comparing the forecasts for 2011 with those of preceding years, one is able to gain a perspective of larger trends and external factors affecting the laser business. 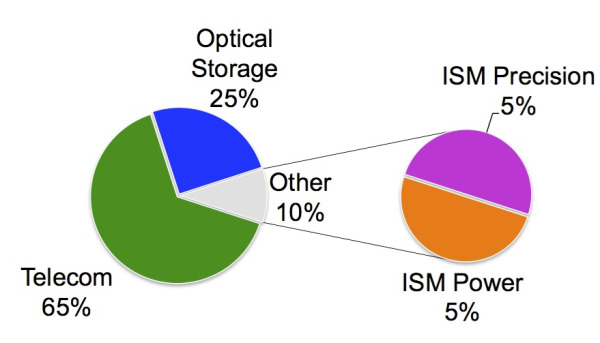 The biggest market for laser diodes is telecom, with about 65% of total revenues, followed by optical data storage at 25%, as shown in the Figure. Telecom is a robust, growing market, but optical data storage has matured as lower prices and increasing use of downloaded content have put pressure on this segment. That leaves about 10%, or about $350 million, for all the other applications of laser diodes, the industrial, scientific, and medical (ISM) market. Further analysis of this market segment shows that about half are used for raw power -- including direct diode cutting and welding, and pumping solid state lasers, such as YAGs and fiber lasers. Most of these are 808 nm broad area pump lasers. The rest is the ISM precision segment, which includes lasers used for scientific and analytical instruments, metrology, reference standards, calibration, and a variety of other high value applications. On a volume basis, 808 nm pumps are the overwhelming market leaders, despite their poor beam quality and broad spectral linewidth. Most of them are used to pump solid state lasers, which act as beam converters, turning a spatially incoherent beam into the diffraction-limited, spatially coherent beam required by the user. In fact almost all end-user laser applications require a diffraction limited beam. This includes telecom, optical data storage, and ISM. Photodigm lasers offer diffraction limited, single frequency performance at the highest powers available for a direct diode. Truly precision instruments, Photodigm lasers are leading the way in applications involving spectroscopy, frequency standards, and calibration. Their monolithic architecture ensures long term reliability and stability, at the same time offering a pathway to scalable economics for volume requirements. Photodigm specializes in the technically challenging AlGaAs materials system, fabricating high power, single frequency diffraction limited semiconductor lasers between about 740 nm and 1100 nm. Within this spectral range are applications in Raman spectroscopy, cold atom physics, interferometry, lidar, metrology and pumping and seeding solid state lasers. Cold atom physics today is a research frontier, but it holds substantial promise for breakthroughs in navigation, timekeeping, and magnetometry. Photodigm is committed to supplying our customers with standard products as well as custom wavelengths and architectures to advance the state of the art in precision instruments. Our roadmap includes increasing power, longer lifetime, and adding value to our customers through by leveraging our experience in precision products. Future blog posts will describe this roadmap in greater detail.